Hervey Bay is considered the Whale Watching capital of the world. The majestic Humpback whales come to play in the warm, sheltered waters every year. Humpback whales weigh up to 15 tonnes and average around 15 metres in length. 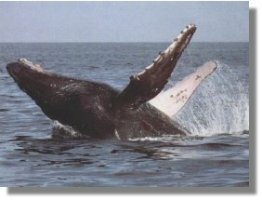 Whales are identified by their unique tails, like fingerprints on a human. Humpbacks generally feed on krill and herring, and have an interesting ritual in catching their prey. It is a group effort where the whales encircle the schools of krill and use noise, and bubbles created off their flipper movement to trap their food on the surface. Below you'll find a few links to sites where you can learn more about Whale Watching and the Fraser Coast.